Silver dressings are medically proven to help with burn wounds as well as other standard wound care. Though it's most effective against dermal wounds and abrasions, silver dressings have also been developed as a topical for acute or chronic exudating wounds. The products listed below are just a few choices you can make when looking for a way to care for their wound. Adherent/Non-Adherent: Silver Dressings come in many shapes and sizes but still give the option of whether a person wants/prefers an adhesive or a non-adhesive dressing. Dressings that have an adhesive border allow the patient or the medical professional to adhere the bandage to the skin, lessening the need for a secondary bandage. If a secondary is needed or can't be facilitated, non-adhesive dressing pads will still perform in the same manner. Both choices make it easy to cover a wound as well as provide the anti-bacterial agent needed. Shapes and Sizes: Silver wound dressings come in many shapes and sizes. From rectangular and square to sacral- and heel-shaped, silver dressings have been made to fit just about any body part. Standard square shapes can measure anywhere from 2 x 2 inches up to 8 x 8 inches. Rectangular will yield a 2-inch wide piece and will run up to 8 inches in length or longer. Other shapes include the heel and sacral region, with another specialty type dressing, the rope dressing. All of these options assures you'll be able to cover up as much of a wound as possible. 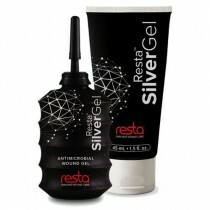 Topical Ointments: While bandages and wound covers contain silver, the time to release the silver could differentiate. This could change your overall heal time. Since direct contact with the skin is preferred when treating, nothing can be better than using topical silver. Gels are able to make full contact with the wound bed, letting it kill of bacteria faster than a bandage or a hydrogel. These are great for getting skin contact, which could let the wound heal faster. The right kind of silver dressings can give you a leg up on healing dermal wounds and abrasions.